November is Osteoporosis Awareness Month. 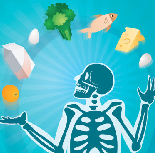 Join us for "Food for Your Bones" to find out how your diet can influence your bone health. Also this month, learn how to create an estate plan at "Estate Planning" and acquire some practical tips and tools to bring you to your optimal stress level and maximize your energy and performance at "Stress Busters". For more information on these sessions, please see the Human Resource Services, OHE November 2016 Lunch & Learn Bulletin and visit The Learning Shop to register.